N ot long after former Blackbird chef David Posey married former Publican pastry chef Anna Posey, they gave birth. "Like a normal couple," Anna tells Thrillist in an interview alongside her husband. "Minus the fact our baby’s not a baby: it’s actually a restaurant." Opened in the West Loop in December 2016, Elske (meaning “love” in Danish) is the couple’s labor of love that has helped redefine the concept of fine dining in Chicago. Serving dishes like apple-glazed veal sweetbreads on wood tables in an exposed-brick dining room, the intimate and minimalist restaurant has been basking in a steady stream of positive acclaim from seemingly every food critic who has ever set foot in the space to help burnish its budding reputation as one of the best new restaurants in America. David, a full head taller than Anna, first met her seven years ago when he was a chef at Blackbird, where she was working as a pastry intern. 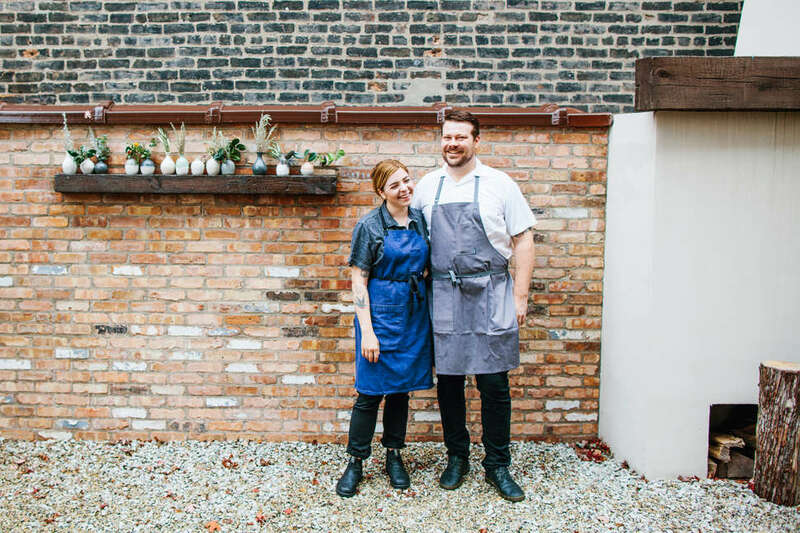 When she left for a pastry chef position at The Publican, they started dating. 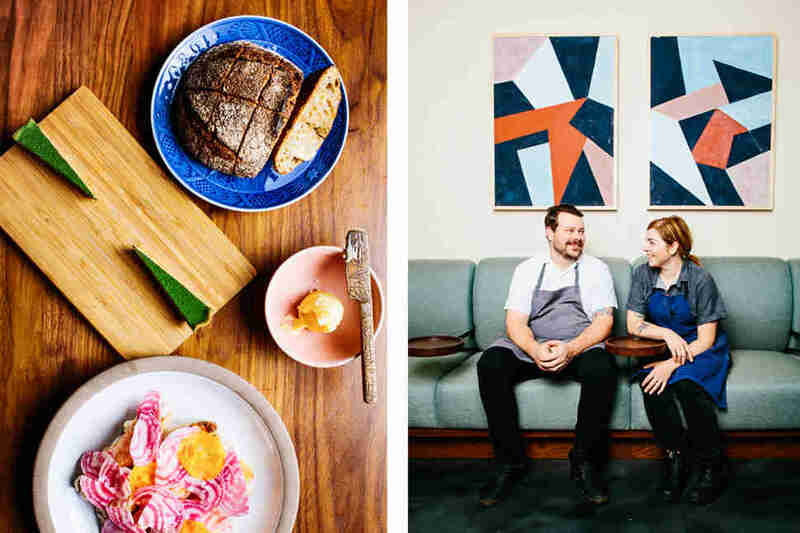 They're both masters of their work, David a two-time James Beard Award Rising Star finalist, and Anna the recipient of multiple nods as Best New Pastry Chef. Today you can watch them dividing savory and sweet duties through Elske's open kitchen. "We never really wanted anything that was too big and unmanageable," David says. He contrasts the vibe with their previous experience at award-winning, busier Chicago establishments The Publican and Blackbird. They've learned that's not what they want. "Opening this very small and intimate restaurant that was only open five days a week for dinner was important to us," he says. As low-key and friendly as the restaurant they run, David and Anna seem surprised by all the attention. They were just looking to create a good restaurant where they themselves would want to eat. There are no gimmicks, no flashy ad campaigns, even -- as David points out -- "no tablecloths." Just delicious food served in a welcoming atmosphere that has much in common with the trendy Danish phenomenon of hygge (loosely meaning coziness or comfort). It even has an outdoor fireplace where you can curl up with a drink and a blanket. "We keep finding ourselves wanting to go back to restaurants in Europe -- whether that’s Paris or Copenhagen or parts of Spain," David says, "where it’s a lot more casual, but you are getting high-end food." Our baby's not a baby: it's actually a restaurant. Because of the casual feel at Elske, however, the line between dining and fine dining has been a tricky one to toe. "We’ve struggled with that a little bit," Anna says. "We feel like compared to certain restaurants we’ve worked at that maybe are Michelin-starred, we are still delivering the same food and service. But because the atmosphere is more casual, it doesn’t feel [like] fine dining. Some people are surprised by that, I think." And make no mistake, the inviting sensibility is something, but the food is phenomenal. Elske specializes in clean, colorful dishes that eschew superfluous presentation in favor of maximizing flavor. Their tasting menu -- an affordable $85, given the care and expertise put into each of its eight courses -- is highlighted by items such as chilled zucchini, roasted sturgeon, and grilled Vegas strip steak, while a la carte offerings include soft scrambled eggs with chicken thigh, pan-roasted quail, and grilled pork loin. In terms of what to get, they recommend whatever's new, as the menu changes seasonally. With fall settling in, David says to look out for chestnuts, pears, and apples in the coming weeks. "Those are kind of what I’m excited about even though they haven’t really hit the menu yet," David says. 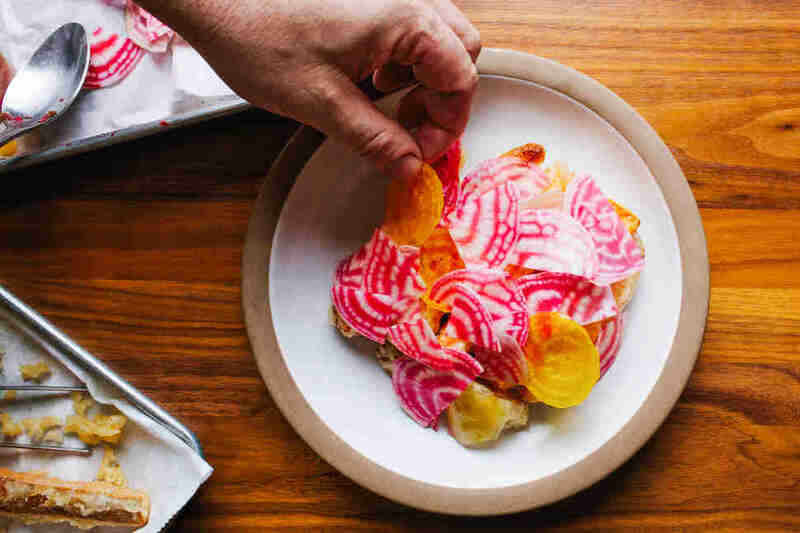 He points to just one mainstay that hasn't left the menu: "The only thing that we’ve actually had on the menu from the beginning is our duck liver tart; that’s really the only staple dish." 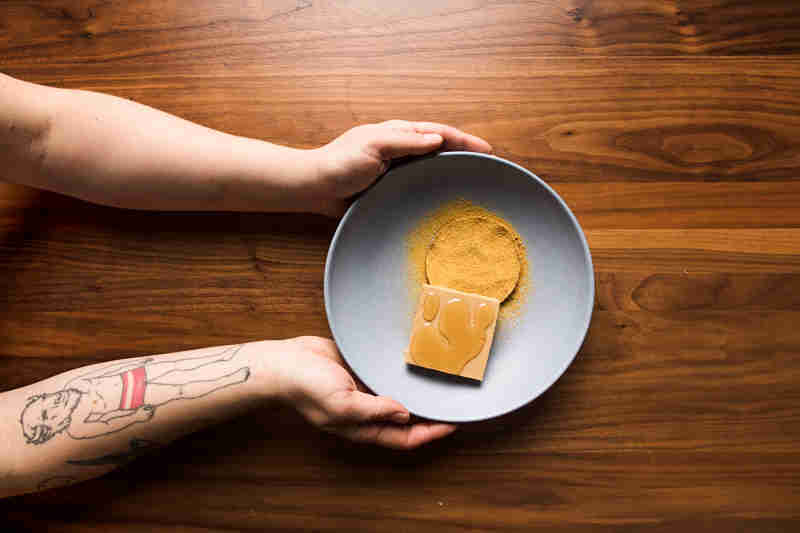 If the duck liver tart's Instagram presence is any indication, it's one of Elske's biggest hits with the couple's ever-growing legion of fans. The wedge-shaped dish features duck liver baked with foie gras wrapped up in a buckwheat crust and topped with a bright green layer of salted ramps. The tart is savory, but its savoriness plays nicely with the rich duck's flavor to create a well-balanced, highly original hit. When it comes to running Elske, the Poseys seem to consider that energy key, both as a couple and as professionals committed to making and delivering great food. To hear them tell it, one year after Elske has opened, they're still excited to run their own restaurant together. Overall, the only thing that’s really Danish about this spot is its vibe -- accented by wallpaper Anna designed to include illustrations of herbs and flowers, art by David's brother Mark Posey, their rotating music selections, and the fact that all the cooks run their food to the tables personally, creating an instantaneous connection with their customers. "The cook drops off the quail they just cooked and then explain [it]," David says. "I think customers and guests are really receptive to that. And they kind of feel the energy and it creates a great energy in the whole room." "I do compare it a lot to a baby because it feels like we have a newborn child. We get no sleep, and no [free] time," Anna says. The five-day-a-week schedule remains an important one, and they're not rushing any expansions hastily. "I’m sure things will change in the future as the neighborhood grows," David says. "But right now we’re enjoying our two days off together."